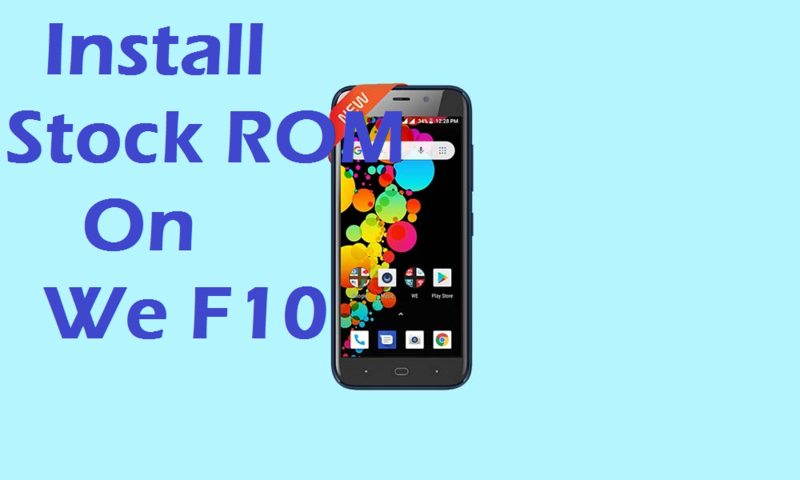 Download and install official stock ROM on We F10 smartphone. Today we come with the official stock firmware for We F10. Now you can install stock ROM on We F10 by following given below detailed guide. The official firmware is based on Android 8.1 Oreo and size of firmware is about 537 MB. The stock firmware file is only for MediaTek MT6580 powered devices. Stock firmware is the stable and safest OS for the device and it is updated regularly from the manufacturer. All Android devices come with stock firmware, which brings many features and customizations. So if you want to install the stock ROM on We F10. Here we share a simple step by step guide on how to install stock ROM on We F10. There are many advantages of installing official stock firmware such as fix bugs lags, Fix the boot loop issue, you can Fix Bootloop and Black screen issue, fix any software issue and much more. If this is your first time to installing the stock ROM on We F10, then no need to worry about that. Here we share a simple user-friendly guide for you. After installing the stock firmware, most of the issues would be solved. With the help of flashing tool, you can install stock firmware on Winds Genius III smartphone. The flashing tool is known as SP Flash Tool, it allows to install official stock firmware on your device. Keep in mind while installing the stock ROM on We F10, your entire data will be wiped clean. Before proceeding to take the full backup of your phone. If you are interested in installing the stock ROM on We F10, then go ahead and follow the given steps. Note: This is an official update and is intended only to Install stock ROM on We F10. So, don’t try on any other device. Also, it may wipe all your data on the device. so, proceed everything only at your own risk. It’s advised to take backup of your entire data on We F10 before installation. Also, keep the battery charging level more 70% for seamless power supply. Also, the We F10 must be on the stock firmware and not rooted. Turn off your device completely. [Remove battery if removable]. Right click on the “SPFlashtool.exe” file in the extracted folder of SP Flash tool and click on “Run as administrator”. Click the Download tab and then click “Scatter-loading” button on the right side of the tool. Then locate and select the “WE_F10_HW1_SW10_20180919Scatter.text” file from the downloaded firmware folder. →then click “Open”. Once the file you want to flash is ticked, click the big “Download” tab, upper side on the screen. Repeatedly press VOL-UP/ DOWN button of the phone to quickly detect by the PC. Then a progress bar on the screen appears. Wait till you see the Success message in Green circle with OK text on the screen. Finally, click OK, wait for a while and then disconnect the device and reboot. Done! You have successfully install Stock ROM on We F10 smartphone.